I have searched for a long time but can’t find posts to help me accomplish what I need to do specifically. I have an ongoing project where I have to manually sort photos into a folder of sub-folders. This folder structure is constant. After I sort them, I would like to use Applescript to change file names then move them to a single folder, “00-Complete”. I’m adding an example below. Basically, I need to remove the first 7 characters of each file name then add “_01, _02, _03” etc. to each file within it’s respective sub-folder so they remain in the same sort order. 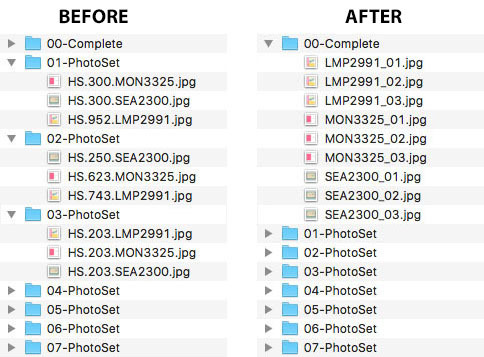 Then move them to the "00-Complete" folder. StefanK, Thank you very much!